Hwy 12 safety improvements project location map. 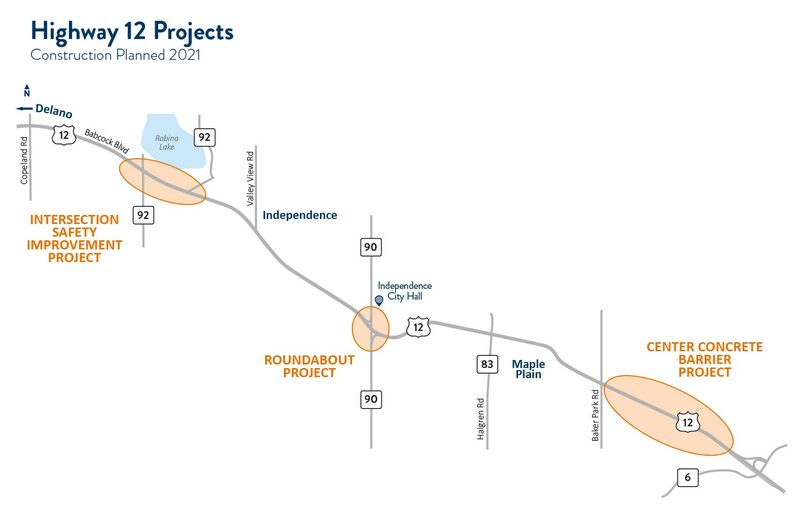 In 2021, MnDOT, in conjunction with Hennepin County, will construct three projects aimed at improving safety and reducing crashes along Hwy 12. On Hwy 12 from County Rd. 6 to Baker Park Rd. in Maple Plain, MnDOT will reconstruct Hwy 12 to install a center concrete barrier. This project will eliminate head-on crashes within this section of Hwy 12. At Hwy 12 and County Rd. 90 in Independence, MnDOT will construct a roundabout. The current intersection has challenging sight lines for entering cars, which contributes to the higher-than-average crash rate. The roundabout will greatly reduce crashes and make it easier for traffic to turn onto and from County Rd. 90. At Hwy 12 and County Rd. 92 in Independence, Hennepin County will lead a project in partnership with MnDOT to address the safety issues seen at this location. Currently, the proposed design is under consideration and more details will be available soon. Center concrete barrier on Hwy 12 between County Rd. 6 and Baker Park Rd. Hwy 12 will be closed at the locations of the three projects. A single detour will bring traffic around the projects. Local residents will maintain access to Hwy 12 where needed. Hwy 12 will be closed to through traffic, a detour will be provided. Details of the proposed detour will be made available soon. Video: How about a roundabout?